Officials in Ecuador say they are worried about the discovery of foreign species on the Galapagos Islands. Despite inspections of incoming ships and planes, local people recently found an iguana and a turtle which probably came from mainland South America. Invasive foreign species are one of the main threats to the islands' wildlife. 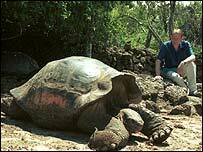 This includes giant tortoises, marine iguanas and finches which enchanted naturalist Charles Darwin and helped him develop his theory of evolution. It is the isolation of the Galapagos Islands which makes their ecology unique. Stranded 1,000km (620 miles) off the Ecuadorean coast, animals adapted to the conditions in their particular part of the archipelago without external influences. Now, though, the isolation of the Galapagos is threatened by foreign species. The archipelago is home to fishermen, a booming tourist industry and a growing number of migrants from the mainland. Development has gone hand-in-hand with the arrival of foreign tortoises, turtles and even a monkey. Officials are particularly worried about the newly discovered iguana which is probably a type which breeds rapidly and could compete with the indigenous varieties. It almost certainly arrived in cargo and was missed by inspectors. Other foreign animals in the Galapagos were introduced deliberately, only for their disastrous impact to be appreciated too late. Naturalists are working to eradicate thousands of feral goats which are a direct threat to the habitat of the Galapagos' giant tortoises.